Join the discussion on our forums! Come discuss Batterhead over in our dedicated Batterhead discussion topic. Rush. 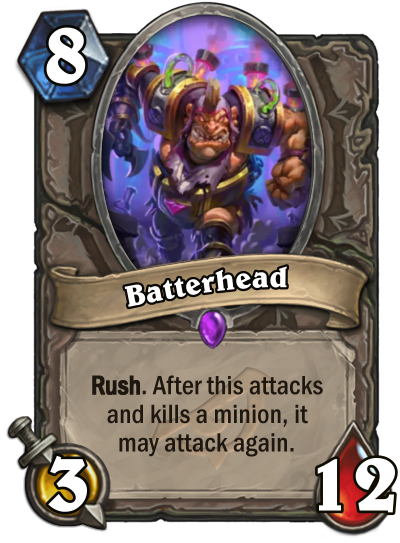 After this attacks and kills a minion, it may attack again. When it comes to problem-solving, he always uses his head. Play this on turn 8, clear the board, let it die. The next turn, summon three copies of it with Mass Resurrection, clear again. The next turn, at least one will survive, buff, Inner Fire, go face.